Pots and pans clattered in the bustling Central Presbyterian Church kitchen as the smell of home-cooked food wafted through the building. The Genesee Valley Cooperative and Student Coalition for Migrant Workers cohosted the first community dinner of the school year at the Central Presbyterian Church in the Town of Geneseo on Saturday Nov. 4. Besides dinner, the event served as a winter coat drive benefitting the Livingston County Migrant Support Center—an organization dedicated to defending and assisting local migrant workers. The evening also featured short addresses from both staff and clients at the Migrant Support Center, whose goals and values were highlighted in the speeches given. Cooperative board members seniors Hannah Embry and Lara Finnerty-Haggerty coordinated the dinner in tandem, from choosing recipes to grocery shopping and preparing the dishes. The dinner’s coordinators deliberately chose to host their event at the Central Presbyterian Church because an off-campus location enabled members from the larger Geneseo population to attend. Cooperative board member senior Sophie Boka reaffirmed Embry’s stated commitment to fostering ties between the Geneseo campus and surrounding municipalities. Sharing a meal in a public space opens the door for deeper connections between members of the same locale who otherwise might not typically interact, according to Boka. The dinner itself—comprised primarily of vegan dishes—adhered to the evening’s fall theme, featuring harvest chili, corn bread, sweet potato fries, arugula beet salad and apple crisp. In the four hours preceding the dinner, cooperative members and student volunteers cooked and prepared these dishes. Rather than contracting formal entertainment, the organizers prioritized creating a relaxed environment, with opportunities for casual conversation that resembled a traditional family dinner. The cooperative’s decision to advocate for migrant workers emerged from a past board member’s involvement with what eventually became the Student Coalition for Migrant Workers, according to Embry. The community dinner ultimately incorporated a coat drive and migrant labor-oriented speakers as a vehicle for the larger goal of fostering a holistic conversation. 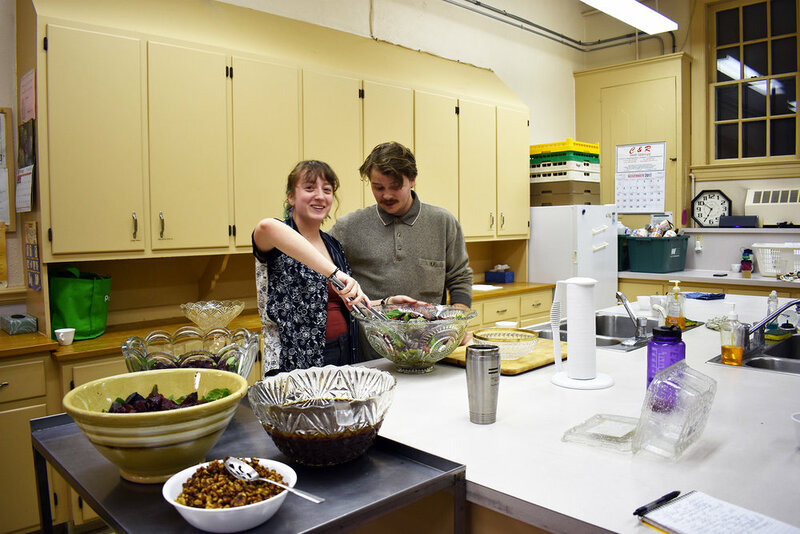 English major senior Blaise Tangney reiterated that the cooperative’s communal values extend beyond their living arrangements, even influencing the way that they prepared for the potluck-style dinner. Tangney also highlighted the cooperative’s past collaborations with the Geneseo Office of Sustainability. To promote the event, Tangney—who has participated in three community dinners—reached out to both the campus and larger Geneseo area. Explaining the cooperative’s significance, Tangney emphasized the organization’s role as a bridge between the dynamic subpopulations of the Village, Town and college.